Pandora FMS events system allows to see a real time record of all the events that occur in our monitored systems. 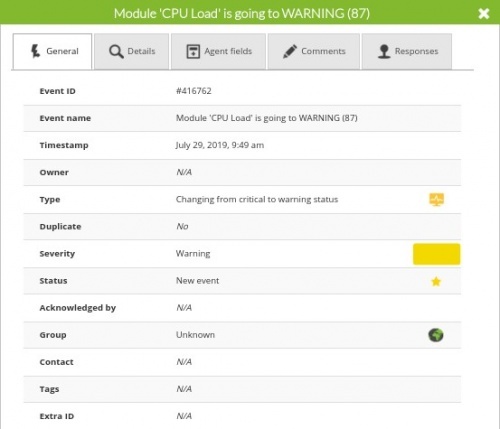 The information displayed ranges from any module status change, alerts triggered or retrieved, to system restarts or custom events. By default, in the event view you will see a photo of what is happening of relevance at that time, it is one of the most used views by the operation teams in any type of professional monitoring software. 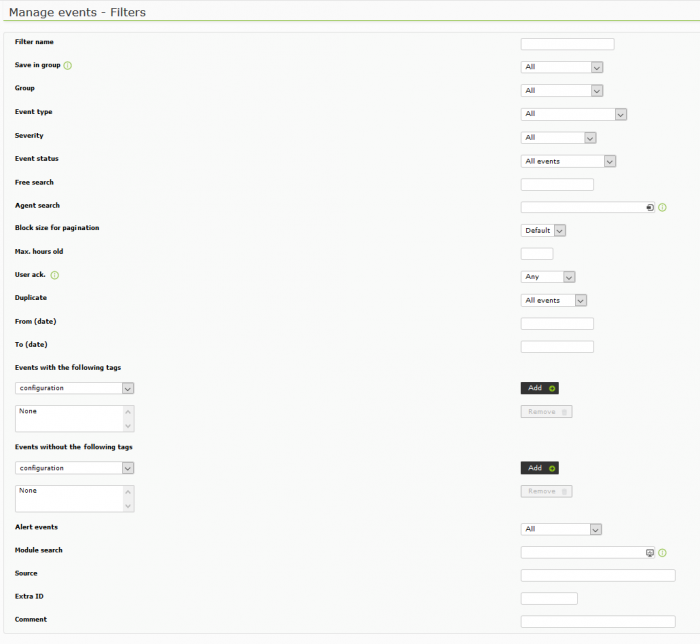 Events are managed in Events > View Events, where you see the following menu. As we can see here, by default (although it can be modified in the setup options), Pandora FMS shows events that are up to eight hours old or less, and shows only those that are not validated. A user who only has access to one group will only see events in that group. By default, groups the events, that is, if we have several events of the same origin and of the same type, it will only show one, and in the detailed view of the event, it will tell us how many events we have equal, grouped in that single item of the list. There's also the possibility of saving a specific search so that you're able to apply filters you've created before. Events are the recording and an essential part of a monitoring system. The operators who see this screen are able to know any information about the monitored system's current state (active events) and all its history (seeing all the validated events), without being forced to look at every single agent. They're also capable of browsing through global figures, data trees, names and visual screens. The operators should see a "clean" event console which is only going to show the active problems. In this way, you won't even have to create alerts. Just by looking on the screen, you're going to see everything that's going on at all times. An event have in three status: new, in process or validated. A default event, as it arrives at the system, is in the New state. When events occur due to module status changes, there will usually be two events: a first event from normal to an incorrect state, and an event back to normal once the problem is solved. In these cases, the events of transition to an incorrect state (critical or warning) are automatically validated when normalcy is restored. This is what we call event autovalidation and is an essential functionality, as it allows you to hide information that is no longer relevant in the event console. When an event is validated, it disappears from the default initial view of events, since in this view the validated events are not shown by default because they are not considered active problems but past problems. By clicking on the validate button, the screen is refreshed and the validated event "disappears". This is because the default event view only displays non-validated or assigned events, but not validated ones. 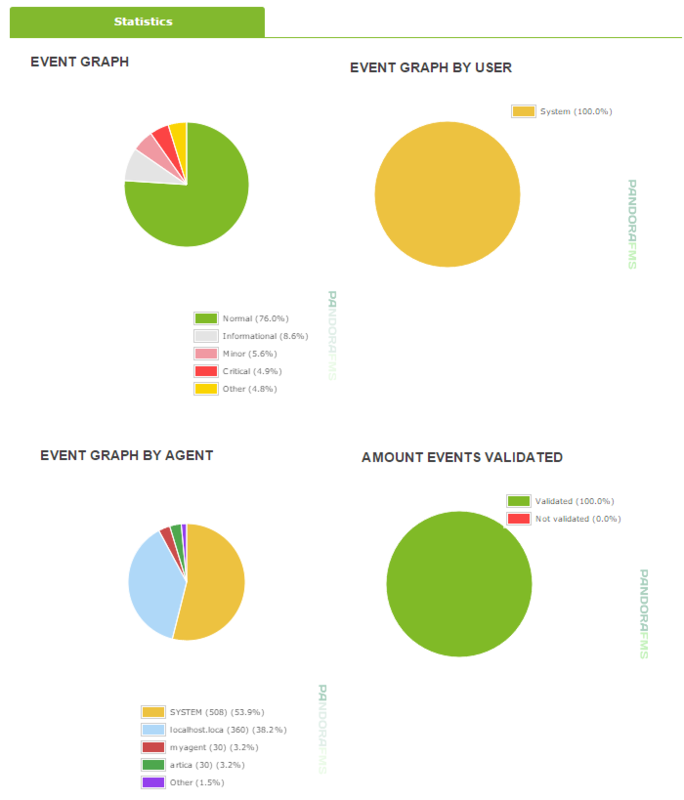 If we load the event view again, filtering and displaying all events, we will see the event validated (with a green cross on the left) with the information of who validated it, when, and with the text you entered at that time. Also in the Responses tab you can find some other possible actions on the event, such as deleting it or executing custom responses such as the ping on the host. In the case of custom responses, the maximum number of events to which the operation applies is limited to ten. 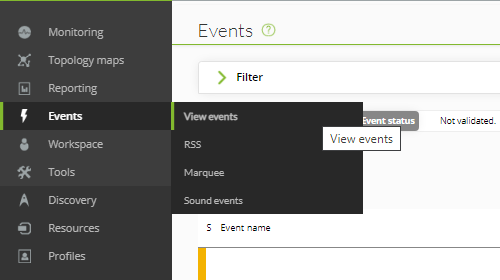 From the Event View page, you can filter in the event list to search for specific events. Max hour old: The field in which the max. age is determined. Repeated: By default, pandora groups the events, that is, if we have 10 events of the same origin and type, it will only show one, and in the detailed view of the event, it will tell us how many events we have equals, grouped in that single item of the list. We can change this behavior to show us all the individual events. You may save the filter or load another one by clicking on the 'Load Filter' icon. Please click on the gray trash icon within the 'Action' column. From the configuration it is possible to define the maximum historical events that we want to keep for its elimination. This purging is performed by the automatic maintenance process of the database (Pandora_DB) that should be executed automatically every hour. There is also an Enterprise functionality called "event history" that allows you to store in the historical database those events that exceed the deletion date. These events are not accessible through the event view, and are only used for special event history reports. Beside the event's classic view which you may call up by clicking on 'Events' and 'View Events', you're also able to pick public news channels such as 'Sliding Marquee' (a moving list on the top of the browser on a black screen). Pandora FMS also has an RSS Event Provider in order for you to subscribe to it from your favorite news reader. To see the events within a news channel or RSS, please click on 'Events' and 'RSS' and subscribe to it from the news reader. To provide access to event RSS feed, you're required to configure which IPs are allowed to access it. To do so, please click on the field named 'IP list with API access' within 'Setup'. It shows the last events in a sliding text-line format. This option is intended to visualize the last events within a monitor like a text screen. You're able to easily customize the number of visualized events or the size, color and filter of the messages by modifying the code within the file named 'operation/events/events_marquee.php'. This new way is a lot easier to manage a system without having to always check Pandora's console. You will be able to hear the different tunes if an event occurs even if you are far from the computer (assumed you've attached some powerful loudspeakers). The tune is going to be played until the sound event pauses or if you press the 'OK' button. A module changes to a 'warning' state. A module changes to a 'critical' state. A module changes to a 'unknown' state. It's also possible to filter the events by their groups/agents. There are three types of events the alert sound is going to be attached to. You may configure any appropriate sound from Pandora's Console setup for each type of event. You're also able to hear the tune even from the setup page. Feel free to test it (if the browser is compatible to multimedia contents) by clicking on the 'Play' button which you're going to find on the right side of any event type. The file has to be in a 'WAV' format. It's recommended to take the smallest possible file, because this file must be sent to the browser in order to be played within your browser's window. Please select a sound file with only a few second's length for the main alert sound, because it's going to be played ad infinitum. Please convert the sound to 'mono'. Please change the sound's coding to '16bits signed' or less. We're going to lose quality but we're diminishing the file's size by doing this. In order to create or edit sounds, we recommend to use tools as Audacity which is a multi platform open-source tool which is also very easy to use. The event sounds are asynchronously 'scanned' every 10 seconds. If an event is received, the preconfigured or default sound for this event is going to be replayed and the window is going to start flickering in red. This window is also going to be placed in foreground of all other opened windows, depending on its browser's and operating system's configuration. To gain access to the sound events window, you're just required to go to the Pandora Console's left menu and to click on Operation and View Events there. Within the header's event window, please click on Sound Events. It's going to show you a new window, which is a lot smaller than the others. This small window is going to be the one which manages all the sound events. It's recommended to leave it open in case any event is received. Inside the window we have several controls that allow us to filter so that the console only jumps according to various filters: group, type of event or specific agent (s). Also, in caseit goes off, a small window will indicate which event is going off. Press the "Play" button to start the sound console. When an event goes off, press "OK" to restart the console and stop the sound (until another new event rings it again). It's possible to export the event list to a CSV file in order for the events to be processed by or incorporated into other applications. In order to export the events to a CSV file, please click on 'Operation' -> 'View Events' and 'CSV File'. It's possible to gain access to the event's statistics by clicking on 'Operation' -> 'View Events' and 'Statistics'. 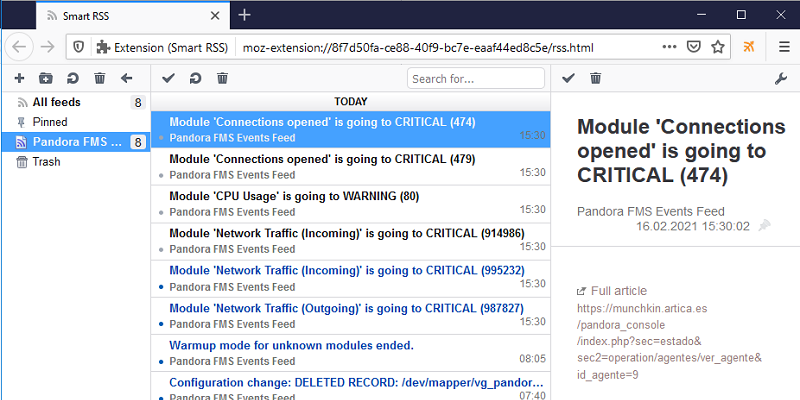 Pandora FMS allows to define alerts on events, which allows working from a much more flexible perspective, since alerts are not generated according to the status of a specific module, but on an event -which may have been generated by several different modules of different agents. This is an Enterprise feature. 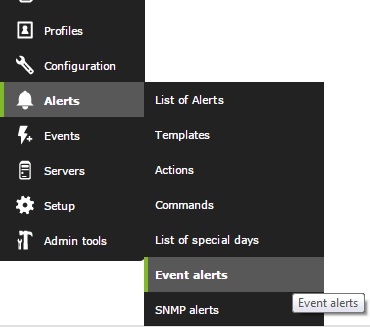 There is a corresponding section for creating event alerts in the alert menu. Event alerts are based on filtering rules using logical operators (and, or, xor, nand, nor, nxor), events matching the filtering rules configured will be searched and if matches are found the alert will be triggered. They also use the templates to define some parameters, such as the days on which the alert will function, however in this case the templates do not determine when the event alert is triggered, but rather it is through the filtering rules that the events that match will be searched and the alert triggered. Rule Evaluation Mode: There are two options: 'Pass' and 'Drop'. 'Pass' means that if an event is fulfilled by an alert, the alerts below are going to be evaluated. 'Drop' means that if an event is fulfilled by an alert, the alerts below are going to be stopped from being evaluated. 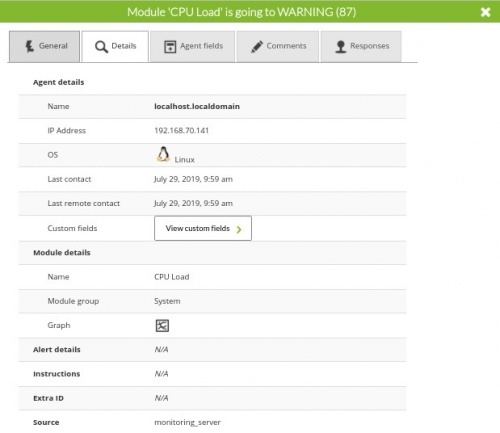 Group by: It allows you to group the rules by agent, module, alert or group. If a rule is e.g. configured for it, it's going to fire if we receive two critical events. If it's grouped by agent, two critical events are required to originate from the same agent. This feature is capable of getting switched off. Each rule is configured to fire by a specific type of event. The alert will be fired if the condition of the logical equation, which is defined by the rules and its operators, is met. User comment: A free-text field intended for a comment. Event: The regular expression that matches the event's text, if it's left blank it is "for any event"
Window: The events which have been generated outside the defined time range are going to be rejected. Count: The number of events which have to match the rule to fire the alert. Agent: The regular expression which matches the agent's alias which has generated the event. Module: The regular expression that matches to the module's name which has generated the event. 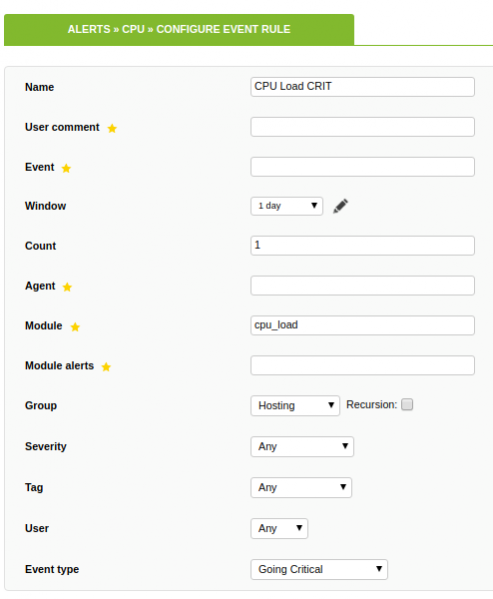 Module Alerts (template): The regular expression that matches the alert's name which has generated the event. Group: The group the agent belongs to. If the recursion box is checked, the rule will also apply to the child groups of the selected group. Tag: The event's associated tags. User: The event's associated user. Given the high number of events the Pandora FMS Database is able to store, the server works on an event window which is defined in the 'pandora_server.conf' configuration file by a parameter named 'event_window'. The events which have been generated outside the specified time range are not going to be processed by the server. Within a rule, it doesn't make any sense to specify a time range wider than the one configured within the Server. In order for the event correlation alerts to work, it is necessary to activate the event correlation server with the parameter eventserver 1 in the Pandora FMS server configuration file. _address_: Address of the agent that triggered the alert. _agent_: Alias of the agent that triggered the alert. If there is no alias assigned, the name of the agent will be used instead. _agentalias_: Alias of the agent that triggered the alert. _agentcustomfield_n_: Agent custom field number n (eg. _agentcustomfield_9_). _agentdescription_: Description of the agent that triggered the alert. _agentgroup_ : Agent group name. _agentname_: Name of the agent that triggered the alert. _agentstatus_ : Current status of the agent. _alert_critical_instructions_: Instructions for CRITICAL status contained in the module. _alert_text_severity_: Priority level, in text, for the alert (Maintenance, Informational, Normal Minor, Major, Critical). _alert_times_fired_: Number of times the alert has been triggered. _alert_unknown_instructions_: Instructions for UNKNOWN status contained in the module. _alert_warning_instructions_: Instructions for WARNING status contained in the module. _all_address_ : All address of the agent that fired the alert. _data_: Module data that caused the alert to fire. _email_tag_: Emails associated to the module’s tags. _event_cfX_: (Only event alerts) Key of the event custom field that fired the alert. For example, if there is a custom field whose key is IPAM, its value can be obtained using the _event_cfIPAM_ macro. _event_description_: (Only event alerts) The textual description of the Thor event. _event_extra_id_: (Only event alerts) Extra id. _event_id_: (Only event alerts) ID of the event that triggered the alert. _event_text_severity_: (Only event alerts) Event text severity (Maintenance, Informational, Normal Minor, Warning, Major, Critical). _eventTimestamp_: Timestamp in which the event was created. _fieldX_: User defined field X. _groupcontact_: Group contact information. Configured when the group is created. _groupother_: Other information about the group. Configured when the group is created. _homeurl_ : It is a link of the public URL this must be configured in the general options of the setup. _id_agent_: Agent’s ID, useful for building a direct URL that redirects to a Thor console webpage. _id_alert_: Alert’s numeric ID (unique), used to correlate the alert with third party software. _id_group_ : Agent group ID. _moduledata_X_: Last data of module X (module name, cannot have white spaces). _moduledescription_: Description of the module that triggered the alert. _modulegraph_nh_: (Only for alerts that use the command eMail) Returns an image encoded in base64 of a module’s graph with a period of n hours (eg. _modulegraph_24h_). A correct setup of the connection between the server and the console's API is required. This setup is done on the server's configuration file. _modulegraphth_nh_: (Only for alerts that use the command eMail) Same operation as the previous macro only with the critical and warning thresholds of the module provided they are defined. _moduletags_: URLs associated to the module tags. _name_tag_: Names of the tags related to the module. _phone_tag_: Phone numbers associated to the module tags. _policy_: Name of the policy that the module belongs to (if applies). _prevdata_: Module previous data before the alert has been triggered. _rca_: Root cause analysis chain (only for services). _server_ip_: Ip of server assigned to agent. _server_name_: Name of server assigned to agent. _target_ip_: IP address for the module’s target. _target_port_: Port number for the module’s target. _timestamp_: Time and date on which the alert was triggered (yy-mm-dd hh:mm:ss). _timezone_: Timezone that is represented on _timestamp_. This tool utilizes a remote HTTP or HTTPS connection to create or validate events under Pandora FMS. Please execute it without parameters to see it's syntax. [-agent_name <Agent name>]  : Agent name, do not confuse with agent alias. [-force_create_agent<0 o 1>]: Force the creation of agent through an event this will create when it is 1. Please enable the API access for the IP (please use '*' for all IPs). Please use a regular user and password or define a specific API user for conducting the operation only. In order to render the 'unknown', 'critical' or 'warning' instruction fields appear within the event details, the event type is required to consist of the types named 'going_unknown', 'going_down_critical' or 'going_down_warning'. It comes with the same functionality as the 'pandora_revent' script with the exception of being able to validate events. This tool utilizes a remote HTTP or HTTPS connection to create or validate events under Pandora FMS. Please execute it without parameters to learn it's syntax. You're required to enable the API access and configure it first. Please follow the below mentioned steps to do so. Please use a regular user and password or define a specific API user only for conducting the operations only. In order to render the 'unknown', 'critical' or 'warning' instruction fields to appear within the event details, the event type is required to be one of the types named 'going_unknown', 'going_down_critical' or 'going_down_warning'. Would look like the one shown below. 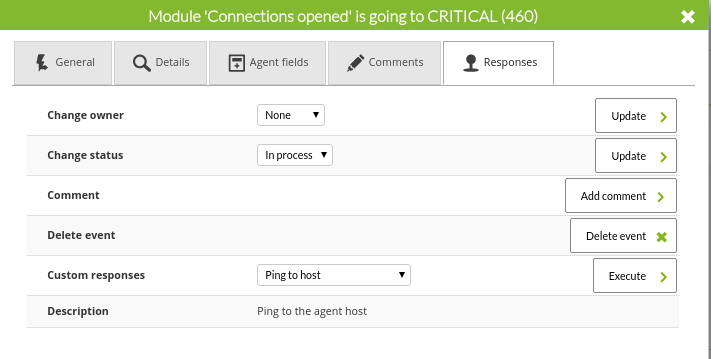 In the Events section in the administration part of Pandora FMS console, you can configure event filtering, event responses and events visualization. It is possible to customize the fieldas that the Event View shows by default. For that, please click on Events' '-> Custom Events, where you'll be able to choose the fields to be shown. Select the fields you want to display from the "Fields available" list and move to "Fields selected" using the arrows. Once selected, press the "Update" button. In this section you may create, remove and edit your filters within this window. If you click on the Create Filter button, you're able to fill out the event fields as shown below. In this section we can create, edit and delete event responses. An event response is a personalized action that can be executed on an event, for example, the creation of a ticket in Integration with the relevant information of the event. You must enter a representative name, the description, the parameters to use separated by commas, the command to use (the latter allow the use of macros), the type and the server that will execute the command.